The initial, closed circuit demonstrations of television in the 1920's gave a foretaste of videoconferencing. Modern interest in videoconferencing began with the picture phone demonstrations in the 1960's. 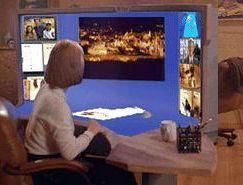 Videoconferencing became practical during the 1980's, though, at this writing, videoconferencing is not yet pervasive. It is inevitable that videoconferencing will be pervasive. Certainly, the science fiction writers see it that way. On the bridge of the Enterprise, the captain says on screen and the videoconference begins. Larry Niven postulates a future in which it is bad manners to turn the picture off in answering a phone call. Videoconferencing in fiction is at least as old as silent movies; Fritz Lang's classic, Metropolis, shows videoconferencing. This book is about mainstream videoconferencing in that it describes what is practical now and in the near future, and in the sense of describing how videoconferencing will become mainstream and pervasive. Videoconferencing should become mainstream by the end of the decade; it is the intent of this book to accelerate the use of videoconferencing and help see it become mainstream. We hope that this work will be accessible and useful to a wide range of professionals who will either use videoconferencing or who will advance the state of the art. Potential users include most businesses, many organizations and some homes. Professionals in communications, computer science, electrical engineering, entertainment, information technology and other fields are likely to have an interest in videoconferencing and the ability to contribute to improving how it is designed and how it is used. We think this book tells how and why it works, and what can I do with it. In some sense, we are trying to provide the book we wanted to read when we started working on videoconferencing. There are very few books at all on videoconferencing, and none of those few address the need we see. We should make it clear that this is not a book on how to purchase and deploy videoconferencing. Products in the videoconferencing industry are changing rapidly, just as in the computer and communications industries that provide the basis for videoconferencing. We believe the manufacturers and suppliers of videoconferencing equipment, networking vendors, telecommunications companies, and others are the appropriate sources of how to information in this dynamic environment. By helping the reader understand how and why it works and what can I do with it, we hope that the reader will be better prepared to read and evaluate the manufacturers information and the how to books that do and will exist. We list much of this information in Appendix II, and provide pointers through http://www.aw.com/cp/duran-sauer.html. There has been much discussion in the trade press about desktop videoconferencing vs. room videoconferencing. It is clear that the primary past usage of video conferencing systems has been in room environments, and it is equally clear that the desktop will be dominant in the number of future videoconferencing systems. However, there need be no either or discussion of these environments. Both will be fundamentally important in the future of videoconferencing. The majority of the issues surrounding videoconferencing are the same in either environment, so we generally consider both desktop and room environments at the same time. One of us (Duran) has spent more than a decade focusing on room video conferencing systems. The other (Sauer) has spent that same time developing workstations and personal computer systems. Thus we are confident that we are presenting a balanced view of both environments. There are three main sections: The Big Picture is an extensive overview of videoconferencing in present and planned use. This should be accessible to all likely readers. Behind the Curtain discusses the technology in more depth. Those without sufficient engineering and software background are likely to want to skip the second section. Down the Road gives our view of where videoconferencing capability and usage are headed. This third section is intended to be accessible to all likely readers. This book is largely self contained, but we have not repeated many of the details which are available in the published standards documents and in several fine books on video coding and audio coding. We have tried to provide what these books and standards do not. For example, we do provide a close look at how video flows through a standard system, since much of the necessary video processing is not described in the standards documents or in other books. Chapter 1: Why We're Here is an introduction to videoconferencing. The purposes of the chapter are to begin establishing a sense of what people have expected and will expect from videoconferencing, to introduce some of the key technical issues and challenges, to describe the characteristics of some representative videoconferencing systems, to outline some of the applications of videoconferencing, and to suggest where the future of videoconferencing may lead. Chapters 2 through 6 expand on the introduction. Chapters 7 through 12, in the Behind the Curtain section, expand on the technical details, and Chapters 13 and 14 (Down the Road) expand on the future. Chapter 2: Where We Come From gives a historical perspective on videoconferencing. We believe that some historical perspective on telephony, television and videoconferencing helps understand the current state of the capabilities of videoconferencing and some of the inertia which affects the future. Chapter 3: Starting on the Desktop begins to explore the technology of videoconferencing, from the perspective of making a personal computer capable of sharing audio, video and data in a conference. Chapter 4: Rooms with a View builds on Chapter 3 from the perspective of a group of people separated into distant conference rooms. The emphasis is on the technology and characteristics needed to stretch the boundaries of the conference rooms so that the group can transcend the distances between the rooms. Chapter 5: All Together Now extends the concepts of Chapters 3 and 4 to consider multipoint conferences with more than two sites. Chapter 6: Finishing the Picture concludes the first section by delving into the applications of videoconferencing. Videoconferencing is not an application itself. Rather, distance meetings, telemedicine, distance learning, entertainment and so forth are the real applications. Chapter 7: Analog, Digital, and Television delves into the technology and boundaries of the analog systems used for most television and the digital realm used for most videoconferencing.. A good part of the success of a videoconferencing product is in effective navigation of these diverse environments. Chapter 8: In Communication Infrastructure we pursue further the most critical aspect of establishing videoconferencing. Videoconferencing has succeeded, so far, by clever utilization of communications infrastructure that isn't quite right. We must continue the trend of careful exploitation of communications designed for other purposes if we are to see videoconferencing become mainstream. Chapter 9: Video is our discussion of the fundamental mathematics that makes videoconferencing possible. The essence is coding, taking a very verbose video signal and making it compact enough to travel across ordinary telephone and computer networking circuits. This chapter and the companion audio chapter contain the most challenging mathematics of the book. We have tried to limit the mathematics to the essentials, but nevertheless, this chapter will be daunting to many readers. We believe we have struck an appropriate balance between making this fundamental material accessible while not trying to make this the dominant portion of the book. Chapter 10: Audio is in some sense the most important topic. Videoconferencing lifts the communication potential of a telephone call (a picture is worth a thousand words), but if the audio quality is lost in the process, the results will be failure. This discussion is the companion to the video chapter, and follows primarily because the mathematics needed for audio was more easily introduced in the video chapter. Chapter 11: Putting It Together with Multipoint is the first of another two chapter pair. Chapter 5 introduced the basics of multipoint conferencing. In Chapter 11 we continue the discussion with more technical detail on bridging audio and video amongst multiple sites, and conducting a multipoint conference. In addition, we cover some of the other protocols which are used to establish and manage conferences. Chapter 12: Multipoint Data completes the pair by examining the protocols needed for sharing presentations and data across a multipoint conference. The bulk of the chapter is devoted to the International Telecommunications Union - Telecommunication Standardization Sector (ITU-T) T.120 recommendations for multipoint data conferencing. Chapter 13: Barriers Breaking Down is mostly about the current challenges to successful videoconferencing. With the technologies and developments we see on the near horizon, these challenges will be overcome, and mainstream videoconferencing will surely be a reality. Chapter 14: Things to Come concludes our vision of where videoconferencing will take us, once videoconferencing is mainstream. Appendix I Summary of ITU-T Standards lists the standards recommendations most important to videoconferencing and gives additional background on some of the standards. Appendix II Web Resources lists some of the World Wide Web addresses that we consider valuable for readers to explore to learn more about videoconferencing. We intend to update periodically a version of this appendix at http://www.aw.com/cp/duran-sauer.html. Since we have tried to make this book accessible to a diverse audience, it is inevitable that we have missed the mark for some readers and have wrongly assumed background in computers, or communications, or photography or whatever. In the text, we try to compensate directly with explanations of basic concepts. We have also included an extensive Glossary. When we first discuss a term in the Glossary, we underline in the style of links used by World Wide Web browsers. We hope readers will find this Glossary to be a handy reference to unfamiliar concepts and terms. In the next year or two, we anticipate dramatic proliferation of standardized videoconferencing using conventional telephone circuits and using the Internet. We have not attempted detailed coverage of these topics at this time, because these areas are seeing such rapid changes, and so far there has been negligible deployment. We hope that reader acceptance of this book will be sufficient to justify a second edition that will cover these topics in detail. For now, we believe that we have provided the right foundation for understanding these topics, and intend to provide additional information at http://www.aw.com/cp/duran-sauer.html. We also would welcome email addressed to DuranSauer@aw.com. We are grateful to the many colleagues who have helped us develop and understand videoconferencing. We would like to thank those who have contributed greatly to this manuscript through their reviews and suggestions, including Rod Bond, Rick Flott, Bill Guthrie, Dave Hein, Bruce Kravitz, Arch Luther, Joon Maeng, Peter Salus, Barry Shein, Errol Williams, and a number of anonymous reviewers. We especially wish to thank our editors, Debbie Lafferty and Tom Stone of Addison-Wesley, for all of their help. We thank all those who have allowed us to reproduce figures, pictures and text in this book. Finally, we acknowledge our debt to Charles Abbitt, Susan Combs, Caroline Sauer, and other family members who have provided not only encouragement and support but significant editorial assistance.